Neha was taught that the more she speaks in a group discussion, the better her chances would be of getting selected. In her eagerness to speak, she caught the wrong end of the bark and blabbered totally irrelevant things about the topic given. Ashish only ends up drawing doodles in every meeting while his bosses drone away to glory. He couldn’t be bothered to listen to what his seniors have to say. As a result, he ended up being in a team that wasn’t his choice. Sam is a great salesman. But he finds that when he tries to explain things to his customers even before they have asked for it, it annoys them. Most of them tell him, “Listen to me, first”. He can’t understand what is there to listen when he is the one who knows everything about the product. Any of the above sounds familiar? Well! Listening is not really a skill we consider important. We naturally interact with people to talk to them. We are constantly thinking of what to say next while we pretend to listen. But in real life, the pretense could cost careers in many cases. Let’s examine the above scenarios to see how they could be dealt with through better listening skills. In Neha’s case, had she patiently listened to others, she could have figured out the correct context of the topic. But launching into her own understanding cost her a seat in that B school. 1. It is a misconception that the person who speaks the most gets selected. On the contrary, this belief only leads to a fish market situation. If you notice, it is only a good listener who can make sense in the melee and restore order by taking over at the end of the commotion. 2. Listening skills come in handy when you are clueless about the topic. Don’t go by yet another misconception that the person who initiates gets more points. It is better to patiently listen to others and understand the topic than to initiate it an inapt manner. Listening to other group members will give you enough material to frame your points and speak. 3. Good listening skills also help you keep track of the path the discussion is taking. You can use this if asked to summarise the discussion at the end. 4. A good listener will not just listen but also comprehend and analyse the points raised in a GD. You will have a better understanding of the perspectives than the others who only nod but not really listen. You can find the basics of listening skills here. We will now look at how to apply them in a GD scenario. 1. Practice active listening: During a group discussion, give undivided attention to the speaker and don’t play with your writing material or look at the panel instead. Don’t let your mind wander to your list of points and how you want to put them across. When you are listening, just focus on that. You should be able to do this with a little practice. 3. Suspend judgement: Make sure that you listen to the speaker till the end and not give in to your preconceived notions. Don’t shut yourself to others’ views and be open to what they have to say. 4. Listen well to speak well: In a discussion, you will be better equipped to make a valuable contribution when you listen carefully and know when to speak. You can demonstrate your listening skills by placing your point in the context of what was said just before you. For instance, “I understand my friend is not quite happy with the new law, but I feel the good part is…”. If you do not listen properly and are in a hurry to just blurt out your point, you will only sound disjointed and make no sense in the context. When you practice group discussions for your placement or graduate school selection, make sure that you put the above points into practice. Listening is an important skill in the corporate world. Unfortunately, we aren’t good listeners and have to make an effort to get good at listening on the job. We have already spoken about barriers to listening but there a few barriers specific to the work scenarios and I’d like to revisit them here. Internal barriers: Ego, insecurity, close-mindedness, restlessness – a whole range of emotions can be barriers to effective listening in a work environment. Speaking is considered to be a more productive activity than listening. We are insecure about having to stay quiet and listen. It feels like we aren’t contributing constructively. Cultural barriers: Accent, vocabulary, customs, language, ethnicity, assumptions about people, differing work cultures – a lot of factors can affect our perception and listening in culturally diverse work environments. We may be affected by an informal work culture where we are used to taking formally dressed people more seriously. Barriers due to the speaker: This is probably the most common barrier in a work place. Our perceptions about people – positive or negative – affects our listening. Assuming that the boss will have nothing important to say or hanging on to every word of your team mate are all unhealthy practice in listening. Active listening is about lending your ear equally to everyone. I have picked up a few most important things that you can do to become better listeners. Make notes: This could be mental notes or jotting down points on a notepad before you. Remember, this does not mean making copious notes which will anyways take your focus off the listener. Writing a word or two about points being spoken about help you keep track of what is being said making it easier to focus. Summarize: This is the best way to figure out if you got it right and eliminates any chances of miscommunication. Whenever possible, make sure you summarize to the speaker to understand any gaps in your understanding. Look for others’ body language: It is equally important to understand other people’s body language when you speak. This helps look for people who may not be attentive, but only pretending to be so. I often have relationship managers from my bank or my phone company coming up with products and services that I might be interested in. I know it’s their job to push products. But if they do a good listening job, they should be able to sense my level of interest. Rather, my disinterest. But I find them pushing it nonetheless. Similarly, I have rarely found people who know the art of listening when an angry customer calls them up or shows up at their door. And if I have ever come across someone who could gauge the purpose of my visit when I had complaints, things have actually become easier and I never have had to actually yell! That’s the power of just patiently lending your ear to someone. Really listen to them: Make it a point to keep quiet during your conversation with the customer and let him talk. You may find this wonderful piece useful in gauging how good a listener you are during your sales calls. When a customer is disgruntled or irate, listening is your only saving grace is calming him down. Cut out distractions: Listening to a customer with all your attention is the key to winning over them in any situation. Use your basic knowledge of listening skills and look out for signals in body language, facial expression to understand his message better. Use your own body language: This is even more critical while listening. Your assured body language – nodding, leaning forward a little – will boost the customer’s confidence in you and will help share all his concerns. Listening is as important in communication as speaking. I have presented their importance for admissions and on the job. You can use these tips to improve your listening skills for any scenario. Believe me! Good listeners are always in demand! Suggested activity: The next time someone talks to you, make it a point to leave whatever you are doing and look at them. Maintaining eye contact helps focus on the listener. You may also try to make mental notes about the points your hear. This will set you on track to respond better and also clarify/summarize later. 1. It’s not about speaking. Speaking briefly and making your point while covering and summarizing is often a better way to be noticed than to give a counter at every other speaker. Out of our two hour sessions, we were speaking at best for 15 minutes each, that too in a 3 minute sounder. 2. 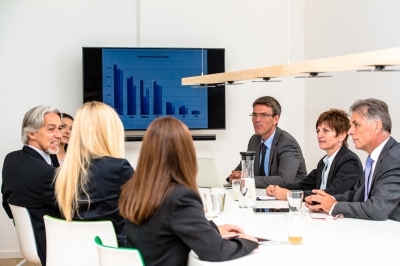 During Corporate Meetings, often the speaker goes at a faster pace than the attendees can keep track off. That happens obviously because the presenter has prepared and knows exactly what all they are presenting and thus feel fluent, while the information is often new and unknown or even uninteresting. In my experience, if you cannot make notes, listen but also use your mobile phone (put it on silent and if need be, ask the presenter before hand if it’s okay) to record the meeting. Recording audio, you get to revisit the presentation as well as the conversation and thus you can always spend an hour or less in articulating your queries/opinions and provide a much better feedback. It helps you to be seen as attentive and informed. 3. In sales, I always feel that it is a conversation that should go in a ping pong format. A good sales person starts with the best feature in 15 seconds pitch and then gives the customer 2 full minutes just to ask about the feature, its utility. I loved this article and felt compelled to add my two cents. Keep writing, Suman. Awesome work. Thanks so much, Rajeev for your precious contribution! Really appreciate it!